What was the hardest part of producing The Multinauts? The Multinauts is a very ambitious project with a wealth of ideas to explore. Most people would wait until they had a network behind them before they made a TV show. However it is logical for me to go ahead and make it rather than wait for an outsider to green light it. Unfortunately because there is no funding, it is very hard to find help doing the post production. Thankfully my friend Brett Hanson offered to edit and completely dedicated himself. Without him I would have been lost. For the Flashback and Mirrorman Episodes, it was just us two. He did all the editing. In addition to directing, I did all of the compositing, effects, producing, and even programmed the website. I missed a lot of sleep, a lot of meals, and there were times where I had to hold back the tears wondering why I was doing it. I also believe that because it was so intense I became completely immersed in the realm and, as a side effect, the look and feel of the show became well defined and a distinctive style was born. In the future, I would love to find funding so that I could work with a team of people and make more episodes in half the time and go deeper into the saga. How did you hook up with people like Ariel Pink and Geneva Jacuzzi? Would you believe that they were Dungeon Majesty fans? Geneva sent me an email in the early days of Dungeon Majesty and we had a correspondence for a year or two. Ariel Pink even wrote a song called Dungeon Majesty that he never released but gave to me on cassette. Eventually I became friends with the two of them because we lived in the same town and were trying to achieve similar things in our work. They both appear in the show out of mutual love and their own desire to live out a television fantasy. What is the best edition of AD&D? How was working on The Multinauts different from Dungeon Majesty? Dungeon Majesty was made in the golden era of the internet when it was ruled by the nerds and the jocks hadn’t yet discovered its potential. There were no internet stars or video diary garbage to sift through. Everyone who was putting shows on the internet was doing it because they were pioneering in new media. The cast of Dungeon Majesty was playing a D&D campaign at the time and we simply decided to televise it. The show took off like a campaign itself. We rolled the dice and watched the show take off and develop. The Multinauts has a much more serious approach. It was created to take DIY television to the next level and is a serious attempt to make a sci-fi show that is completely in the genre. It is not a parody or aesthetic based rip-off. Dungeon Majesty will always remain the most treasured time period of my life because it immortalized the cast’s friendship at that time. What programs/equipment do you use to do your compositing? 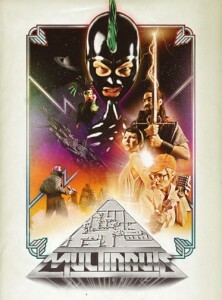 Are you planning to do more episodes of The Multinauts? Perhaps, because the threat of a mutant corporation taking over the world is very real to me. Currently I’m working on an immersive virtual reality project , getting more involved with analog equipment, and thinking of making a feature length film. Music plays a big part in The Multinauts, and I love the extended disco-freakouts your work makes use of. Aesthetically, how do you see music informing your work? I’m a huge fan of BBC Radiophonic Workshop and collect British library records. I love the concept of musicians aiding in telling a story through experiments in sound and on the side of library records, musicians writing pieces in hopes of it being attached to a visual. When setting out to make The Multinauts I knew exactly how it needed to sound. Luckily I know some really talented and dedicated musicians. Elan Polushko wrote the show’s riveting theme song and also lends his speaking voice in the role of Tetra. He grew up in London and thus was raised on BBC and ITV programming, which are sources of inspiration for the show. He did a lot of scoring for Dungeon Majesty so when it came time to make the The Multinauts, we had already developed a very good working relationship. Seth Nemec, who made a bunch of the show’s sound effects and wrote most of the music for The Mirrorman episode builds his own synthesizers and has a very unique vision. His music is in the lines of Michael Boddicker and John Carpenter. He signed up to help out the minute he heard we were doing something based in the Multiverse. Without much effort, the visuals and the sound are constantly influencing each other. How does your photographic work influence your video work? My photographic work is an exploratory diary. Nothing is ever set up or staged and I use it to help me understand my own life. Because I was raised in the heart of Hollywood and am obsessed with movies and television, my photos are often a record of the evolution of stardom and celebrate the beauty of fandom. I earn my living taking photographs and have worked on “real movie” sets and have photographed “real stars”. I have always wondered why there was a hierarchy in Hollywood. I never could understand why Reece Witherspoon was more important than LaTiza from Dungeon Majesty or why the CGI effects in Independence Day are considered good while the effects in Galaxy of Terror are considered cheesy. Everything evolves. All stars fade and all technology becomes obsolete. My photographs help me try and figure these things out and record the stages but somehow photographs weren’t enough for me. I was living in London having the time of my life and came home to Los Angeles with the sole desire of making DIY television. Three months after coming home, Dungeon Majesty was created. Four years later, The Multinauts was born. My photographic work and video work go together because they serve the same purpose. My photographs take me on adventures in the real world and show me what avenues to follow in the fantasy realm. Is that her real name or a stage name? “Jennifer Juniper” was a song by Donovan – just wonder if she was named after it. (Assuming that is her real name and not a stage name). Interesting. Stage name or namesake? i have no idea. i should have asked her though! It is my real name! My mother and her best friend were pregnant at the same time. They were huge Donovan fans , so I was named Jennifer Juniper after the song title and her friend named her daughter Juanita after chorus in song the Mountain. My stage name is Pegasus Polaris! yeah, I know…that doesn’t make any sense. But why should I question the sense of anything from the 60s? Actually that one line does make sense. Sounds straight from a French dialogue that I learned in high school circa 1960. We would go around the classroom in turn, “Je m’appelle Jennifer. Et vous?” The reversal of putting the name first sounds rather poetic. Granted, the line probably does not work within the context of the song lyrics.